I don't wanna cut. I wanna sew. Whine, Whine, Whine. There now that I have that out of my system, I want to share with you my next project. I've been reading about all the PJs that Ody has been making and now I want some new ones. Thanks Ody. Since I couldn't find the right color in my stash for neck binding, I had almost given up on making the PJs. You see, I have the most perfect hot pink cotton lycra to go with the purple pants. But I wanted a purple neck binding. I thought it would look cute if I cut out the PJs on the fabric and make appliques on the t-shirt. I know they are only PJs. Nobody would see if I had the right color neck binding. But I would and it would really bug me. Luckily, I found some cheap clearanced T-shirts on sale at Fashion Bug that didn't fit too badly. They were $7.70 a piece and matched perfectly to the pants fabric I had in my stash. The purple t-shirt matches the dark purple color in the background even though it doesn't look like in the picture. The purple pant fabric is flannel and the other is a good quality quilting cotton. I'll need to add a bit more hip room to my TNT elastic waist pants pattern because I want these to be roomy and comfortable. Now, anyone want to come over and cut them out for me? After reading about Melissa's new face lift she did to her blog, I decided it was time to do something about mine. I never did like it. Too plain, too much of the template, not enough me. While Melissa decided to make her blog less colorful, I decided to make mine more colorful. I think it now shows my personality much better. I have absolutely no HTML skills, and of course, Husband who is a computer programmer could help me. But he is instead sleeping in today. So I had a go at it all by myself. 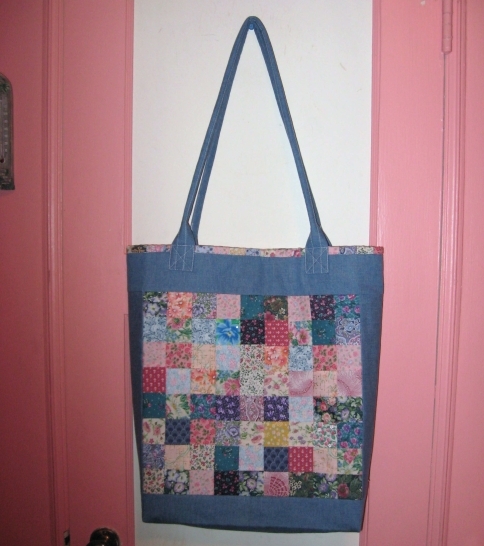 For my header, I decided to use a portion of a patchwork tote bag I made as a Christmas present. I didn't share it with you. Sorry. Here it is. During October, November, and December I was teaching a severely handicapped special ed class. It was such a wonderful experience, mostly because I had the best staff to work with. My teacher's aid got this bag. Hi Cathy! Here is another item I've made lately and not shared. It's a Walkman CD player purse. I decided that sticking the thing in my bra just wouldn't do when I went out of the house. I put two CD pockets inside. I listen to books on tape while I sew and when I go for walks. I joined the YMCA this last week and took two step aerobic classes and did one day of weight training. I feel great. I think the last of the diet soda and sugar substitute poison is out of my system. I'm starting to think I could like to exercise. Not love it, but maybe like it somewhat. None of my clothes feels like their going to fall off of me yet, but maybe soon! Then I'll really have a new look. I was very busy on my sewing machine last weekend. I needed to re-introduce myself to my family. I got the myshape.com t-shirt finished. I really love the way it turned out. I want to make it again. I have a few fabrics in my stash that I'm thinking about using. Instead of sewing the pleats, I used gathers, but I think mine looks really good. I'm not crazy about rayon lycra knits. It shows every bump and buldge, but you get the idea. My next one will either be a poly lycra or a cotton lycra knit from my stash and I'll get started on it today. I finished my pattern draft for the CWC layered tunic. I hope to get both of these cut out and sewn today. I'm working only 1/2 days next week so if I don't get them done, I can work on them this week. I'm actually enjoying using my stash. As another entry to the PatternReview.com Fabric Stash Contest, I made this Ottobre tunic top. I really like this pattern even though it has a slightly pregnant look on me. You can't tell so much because of the very busy print. 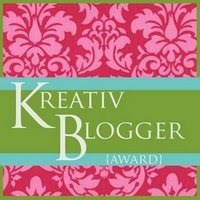 I almost forgot, Jacqui of Sweet Notions nominated me for the Kreative Blogger award. I would like to thank Jacqui for this thoughtful award. 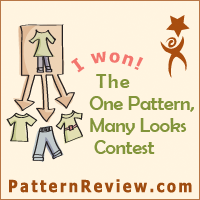 While I'm not as frequent a blogger as I'd like to be, I hope that I can do more sewing this year deserving of this award. I've been awarded other award by wonderful bloggers in the past and I've forgotten to include them in my blog because I wasn't blogging very regularly. However I'm going to do better at posting so this should not be a problem anymore. Bunny at La Sewista! who makes the most beautiful heirloom items. Trina at The Slapdash Sewist who truly does sew like the wind. Caitlin at Caityquilter who's life I can relate to in so many ways. Michelle at Happilycaffinated who is a fairly new sewist and impressing me with everything new thing she sews. Muffet at Eyelets in the Seams who is doing some great things with the Lutterloh pattern system. Keely at Keelysews who loves to sew for her family and makes the most beautiful things from Ottobre Magazine. Christina at Assorted Notions who keeps me in touch with what the younger crowd is wearing these days and has a real sense of style of her own. I know I've disappointed you for being gone so long. It's been over a month since I've blogged. I feel like I'm in a confessional and I'm not even Catholic. The reason I've been gone so long is that I've been doing some deep thinking about my life. You can stop reading now if you don't want maybe TMI. I turned 47 in 2008 and I'm now on the downward slope to 50. I've been trying to lose weight since I was in my early 20's when I only weighed 119. Dieting has become part of my life and I just keep getting larger. I haven't always been fat, just since having my son did my weight spiral out of control. Now I'm starting to fear for my health. I don't have any problems right now, but I can see them in the near future if I don't get this under control. One of the reasons I gained the weight in the first place was because I was gifted with a special needs child. He has cause me stress that only a mother of a special needs child can understand. Eating was my medication of choice to help me get through the day. Now, I'm happy to say, Son is a healthy, happy, well-adjusted, and a fairly NORMAL child at 14. I don't have to eat to medicate myself to relieve the stress. That stress is gone. I also gained weight because I had an intestinal problem which turned out to be a blockage in my gall bladder that caused me severe pain if my stomach didn't have something in it. Every time I felt pain, I would eat. It worked, until I had a severe gall bladder attack and had it removed. Now I don't have that excuse any more either. So, why am I still so large? I think I gained the last 20 pounds because I'm going through menopause. It's been 11 months since my last period. Just one more month to go before I can officially say I'm in menopause. It's very exciting, but I think the hormone thing has cause the weight gain. I haven't changed my diet at all. In fact, it may have even gotten healthier. My metabolism has slowed down to a snail's pace. I'm done being fat. Plain and simple. I'm back on Weight Watchers and committed like I've never been before. I have sworn off sodas, high fat dairy, sugar substitutes, and sweets. Now I know all you are thinking that I'm crazy and this will never work. Wrong! I need to do these things for my health. You see, I've been a vegetarian for over 20 years, completely eliminated animal flesh of any kind in my diet, Yep, if it had parents I don't eat it. Now I still eat eggs, but no dad! It's time I take the big step to Veganism. I won't go cold turkey, but I have been gradually adding in substitutes for eggs and dairy into my diet. I've always know it's easier to make big changes than little ones, but I can't. However, to this end, I'm eating very low on the food chain these days and really enjoying every minute of it. Water is the only liquid I drink. If all you are drinking is water than it's easy to get it all in. Exercise hasn't been as easy to do as changing the food. I hate exercise. It hurts to exercise. I have arthritis and way too many pounds to move comfortably. However, now the treadmill is in the living room right in front of the TV. I can't even see the TV from the couch. My goal is to walk 30 minutes five days a week. If I go a little longer or maybe even run a bit, all the better. Just to keep me honest, I have to share this with you. I'm starting this journey at 200 pounds. Yep, that's right, 200 pounds! I can hardly believe it myself. At 5'1" tall, that horrible. Worse yet is that I've already lost 5 pounds to get to 200 pounds. So, in case you were wondering if this sewing blog was going to become a weight loss journal, it isn't. I just thought that I could share all this with you, my sewing friends and you would encourage me along the way. After all, if I lose weight I'll have to come up with new alterations for new patterns and sew me some new clothes. I'm hoping you, my sewing friends, will be with me as I move down this new path to a healthy happy new me. Thanks for listening and being there for me.